Been awhile since we heard from our friend Joey Logano, whose No. 20 Toyota routinely sports some kind of GameStop hood ornament touting a current or upcoming game. Let's fix that. Logano has a 21-race sponsorship deal and in the past has sported Split/Second, Mario Kart Wii, BioShock 2 and Modern Warfare 2 front and center during his NASCAR Nationwide series races. Tonight, Logano races in North American track motorsports' longest race, the Coca-Cola 600 at Charlotte Motor Speedway (where his sponsor is Home Depot, as it's a Sprint Cup race). So let's give Joey a hood decal that you could see wheeling into the winners' circle tonight. And no, I'm not imagining him pulling on a ballcap and crediting the No. 20 RapeLay Toyota crew for giving him a super car that just run real good tonight, either. Let's have some standards here. But the esoteric and ridiculous are definitely what I have in mind. Source Image: Joey Logano's No. 20 Toyota (Modern Warfare 2 paint job). Source Image: Joey Logano's No. 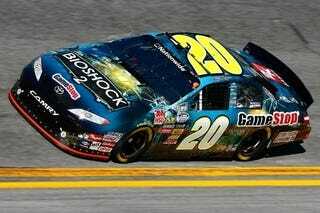 20 Toyota (BioShock 2 paint job). Alright, you know the drill: Post your submissions in the comments below. Best 20 get rounded up in a gallery next week. 'Shoppers, start your engines!